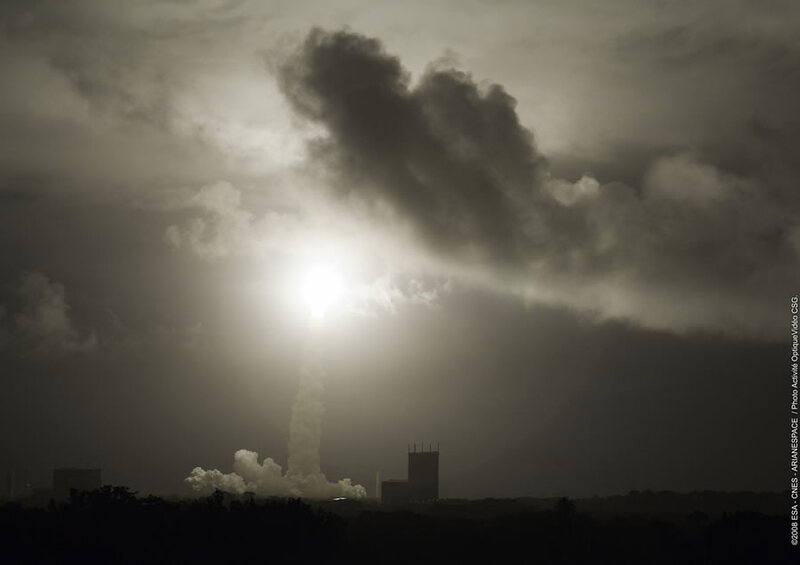 Sunday 9 March, on its 37th launch—the first in its ES-ATV configuration—Ariane 5 successfully placed the European Jules Verne ATV into elliptical Earth orbit. In 3 weeks’ time, it will be approaching and docking with the International Space Station (ISS). 7 March, the Launch Readiness Review at Arianespace gave the go-ahead for Ariane 5 to roll out to the launch pad in preparation for lift-off. Two days later, the launcher soared skyward bang on schedule—and it had to: due to its unique mission profile, 9 March was the last opportunity in the launch window that opened 27 February for the Jules Verne ATV to depart on its maiden voyage. “With a payload of 19.4 t to place into a highly inclined orbit relative to the equator, the launch of the Jules Verne ATV was a first for Ariane 5. […] This unique mission mobilized all of the expertise at CNES’s Launcher’s Directorate (DLA),” said CNES President Yannick d’Escatha on congratulating all of the teams involved. The ATV began its journey under a cloudy but wind- and storm-free sky, executing its flight plan perfectly. In particular, successive reignitions of Ariane 5’s upper stage—developed especially for this mission—occurred exactly as planned: more than 1 hour into the flight to release the ATV, and then a few minutes later to put the launcher on the right trajectory to re-enter and burn up in the atmosphere. Once the ATV had reached its planned orbit, mission control switched to the ATV Control Centre (ATV-CC) in Toulouse, France, which confirmed that the spacecraft was responding nominally. Working like clockwork, the ATV slowly deployed its 4 solar panels, achieved star lock thanks to its star trackers and activated its GPS receivers. The only moment of concern for control teams came when the spacecraft’s onboard computers detected a slight difference in pressure in its propulsion tanks. This caused the ATV to immediately switch over to the second of four propulsion chains, as it is designed to do. 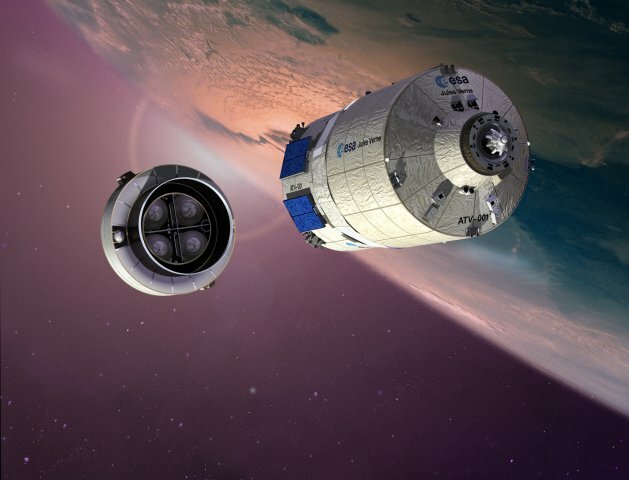 Engineers at the ATV-CC and in Les Mureaux are evaluating and analysing the data coming from the spacecraft and assessing the consequences, if any, for immediate planning of operations. In the meantime, the ATV’s mission has only just begun. The next step will be to validate back-up systems. A 1st approach to the ISS is planned 29 March, to within 3,500 m, followed by a 2nd on 31 March to within a few tens of metres. Final docking with the ISS is scheduled 4 April, after which the Jules Verne ATV will stay berthed to the station for 6 months.